The rate of injury hospitalization among children under 5 due to falls (the leading cause) fell from 136.8 per 100,000 children under 5 in 2006/07 to 122.1 in 2012/13. The rate of poisoning hospitalization fell from 40.9 in 2006/07 to 35.5 in 2012/13. 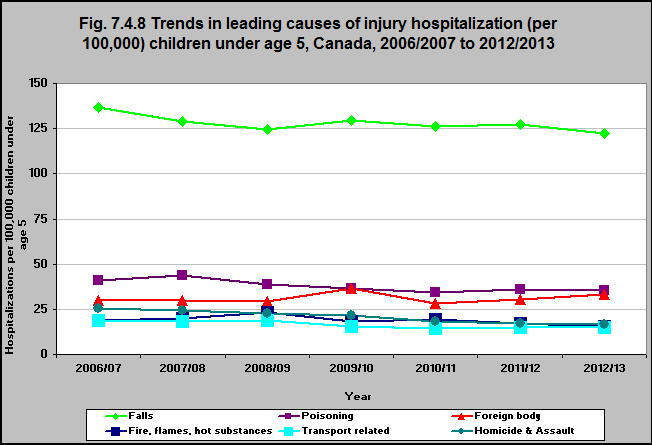 The rate of transport related hospitalization fell from 18.8 in 2006/07 to 15.0 in 2012/13.